Jam Genius--A Catalyst for Your Creativity. Jam Genius creates unique chord charts for you to play with your friends. There are no words or melodies, just simple chord progressions that most guitarists, bass players, pianists, sax players, and other musicians will be able to play and/or improvise over. 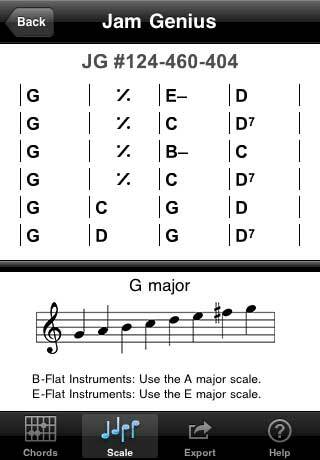 Simply use the notes from the key of the chart, and improvising might be a lot easier than you think. See Tips on Jamming for help getting started with jamming and improvising. Jam Genius gives your jams a more ‘composed’ feel. No more meandering around: Jam Genius will keep your jamming on track, providing a platform for your creativity without getting in the way. There are well over 100,000 possible charts; every time you create a chart, you’ll get something new and different. Once you create a chart, you can read it right from your iPhone or iPod Touch, and have a friend improvise along with you. Or, you can email to your fellow musicians, and they can read it from their devices. You can print out copies if you’d rather read from paper, and you can keep the best ones if you want to jam on them again and develop your ideas. If you turn one of these charts into a song or recording, you'll own all the rights to the song. If you're a keyboard player or guitarist working on your chord-reading ability, Jam Genius can be a powerful learning tool. 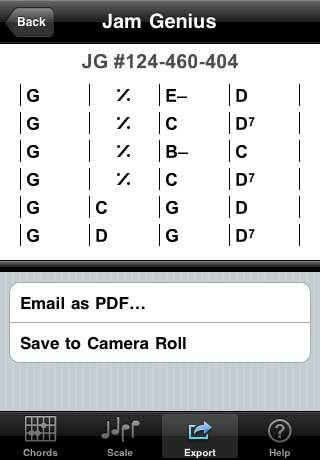 For 'true' sight-reading practice, play each chart only once, then create a new one. That way, you won't end up relying on memory, and you'll keep your sight-reading skills sharp. If one of the charts strikes your fancy, you can email it or export it to your photo roll to work on later, and then let Jam Genius keep creating fresh chord progressions. To keep your practice sessions challenging and interesting, try playing each new chart with a different rhythm and tempo. Jam Genius runs on any iPod Touch or iPhone, however, it requires iPhone/iPod Touch OS version 3.1. Jam Genius does not produce any sound itself, only the chord progressions for you and your friends to play. 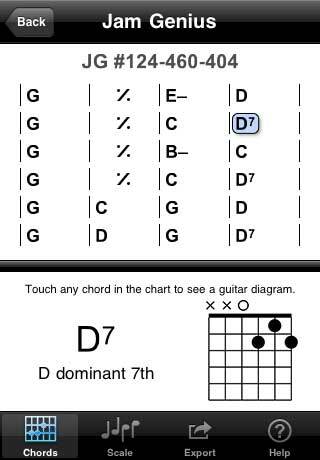 You'll need basic knowledge of chords and/or scales your instrument(s). You'll need to know major, minor, sus4, and (dominant) seventh chords on your instrument (if you're going to be playing rhythm), and how to play major and natural minor scales (if you want to solo/improvise over the chords). You can select keys that are easiest for you to get started with, and then move on to the more difficult keys. There are resources to look up chords and scales you're not familiar with. Try searching the iTunes App Store for scale and chord apps for your instrument, or check a music store for scale or chord books. 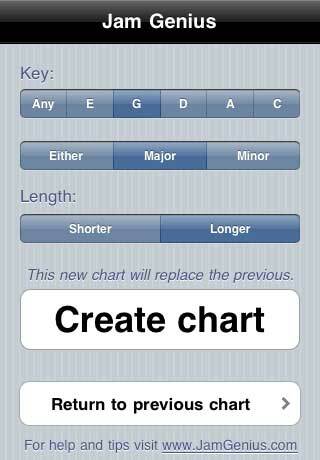 This application was designed by guitarist Jon Lukas, who holds a B.A. in Music, and has many years of performing, recording, and jamming experience in numerous styles. Programming and user interface optimization are by Jacob Lukas. If you play jazz, and are looking for some more challenging material, we highly recommend iRealBook, an outstanding iPhone/iPod Touch app which contains the chords to about 700 classic songs (basically Real Book vol. 1 and 2), and has advanced features like playlists and transposition. iRealBook was part of the inspiration for Jam Genius, and for that, many thanks go out to its developer, Massimo Biolcati. © Copyright 2010-11 by Jon Lukas. All Rights Reserved.